With this introductory text, Steve Wilkens takes a fresh, friendly approach to understanding and evaluating various ethical systems. Beginning each chapter with a "bumper sticker" slogan ("If it feels good, do it"; "God said it, I believe it, that settles it;" "When in Rome"), he then moves on to examine the complex questions, conclusions and assumptions that lie at its heart. ^^Wilkens acquaints students with the vast array of classic and contemporary approaches to ethics: cultural relativism, emotivism, behaviourism, hedonism, ethical egoism, atheistic existentialism, utilitarianism, categorical imperative, hierarchicalism, situation ethics, theistic existentialism, theological voluntarism, and natural law ethics. For each system, his thorough introduction explores its popular "bumper sticker" expression, its core assumptions and basic elements, the questions that give rise to it, and its strengths and weaknesses. ^^Students, professors and general readers will welcome Wilken's engaging text which simultaneously offers a well-rounded assessment of ethical systems and shows the relevance and prevalence of ethical ideas in daily life. 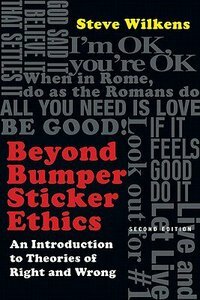 About "Beyond Bumper Sticker Ethics"
Steve Wilkens (Ph.D., Fuller Theological Seminary) is professor of philosophy and ethics at Azusa Pacific University in Azusa, California. He has also taught as an adjunct faculty member at Mount San Antonio College, Glendale Community College, Fuller Theological Seminary and Azusa Pacific University's C. P. Haggard Graduate School of Theology. His books includeGood Ideas from Questionable Christians and Outright Pagans,Christianity & Western Thought, Volume 2: Faith and Reason in the Nineteenth Century(coauthored with Alan Padgett) andBeyond Bumper Sticker Ethics. He is also coeditor with Paul Shrier and Ralph P. Martin ofChristian Calling, Christian College: Higher Education in the Service of the Church. Ideas have consequences. And sometimes those ideas can be squeezed in to slogans, slapped on bumper stickers and tweeted into cyberspace. These compact messages coming at us from all directions often compress in a few words entire ethical systems. It turns out that thereas a lot more to the ideas behind these slogans--ideas that need to be sorted out before we make important moral decisions as individuals or as societies.In this revised and expanded edition of Steve Wilkens's widely-used text, the author has updated his introductions to basic ethical systems:cultural relativismethical egoismutilitarianismbehaviorismsituation ethicsKantian ethicsvirtue ethicsnatural law ethicsdivine command theoryHe has also added two new chapters:evolutionary ethicsnarrative ethicsWith clarity and wit Wilkens unpacks the complicated ideas behind the slogans and offers Christian evaluations of each. Steve Wilkens (Ph.D., Fuller Theological Seminary) is professor of theology and ethics at Azusa Pacific University in Azusa, California. He has also taught as an adjunct faculty member at Mount San Antonio College, Glendale Community College, Fuller Theological Seminary and Azusa Pacific University's C. P. Haggard Graduate School of Theology. His books include Good Ideas from Questionable Christians and Outright Pagans (2004), Christianity & Western Thought, Volume 2: Faith and Reason in the Nineteenth Century (co-authored with Alan Padgett, 2000); Beyond Bumper Sticker Ethics (1995) and Christianity & Western Thought, Volume 3: Journey to Postmodernity in the Twentieth Century. He is also coeditor with Paul Shrier and Ralph P. Martin of Christian Calling, Christian College: Higher Education in the Service of the Church (2005).